This book contains details of the services available within the JBossESB. 1.1. What is the Registry? 1.1.2. Why do I need it? 1.1.3. How do I use it? 2.1. What is a Rule Service? 3.1. What is Content-Based Routing? In the context of SOA, a registry provides applications and businesses a central point to store information about their services. It is expected to provide the same level of information and the same breadth of services to its clients as that of a conventional market place. Ideally a registry should also facilitate the automated discovery and execution of e-commerce transactions and enabling a dynamic environment for business transactions. Therefore, a registry is more than an “e-business directory”. It is an inherent component of the SOA infrastructure. It is not difficult to discover, manage and interface with business partners on a small scale, using manual or ad hoc techniques. However, this approach does not scale as the number of services, the frequency of interactions, the physical distributed nature of the environment, increases. A registry solution based on agreed upon standards provides a common way to publish and discover services. It offers a central place where you query whether a partner has a service that is compatible with in-house technologies or to find a list of companies that support shipping services on the other side of the globe. Service registries are central to most service oriented architectures and at runtime act as a contact point to correlate service requests to concrete behaviors. A service registry has meta-data entries for all artifacts within the SOA that are used at both runtime and design time. Items inside a service registry may include service description artifacts (e.g., WSDL), Service Policy descriptions, various XML schema used by services, artifacts representing different versions of services, governance and security artifacts (e.g., certificates, audit trails), etc. During the design phase, business process designers may use the registry to link together calls to several services to create a workflow or business process. The registry may be replicated or federated to improve performance and reliability. It need not be a single point of failure. From a business analyst’s perspective, it is similar to an Internet search engine for business processes. From a developers perspective, they use the registry to publish services and query the registry to discover services matching various criteria. A registry allows for the registration of services, discovery of metadata and classification of entities into predefined categories. Unlike a respository, it does not have the ability to store business process definitions or WSDL or any other documents that are required for trading agreements. A registry is essentially a catalogue of items, whereas a repository maintaines those items. As the W3C puts it: An SOA is a specific type of distributed system in which the agents are "services": http://www.w3.org/TR/2003/WD-ws-arch-20030808/#id2617708. The key components of a Service Oriented Architecture are the messages that are exchanged, agents that act as service requesters and service providers, and shared transport mechanisms that allow the flow of messages. A description of a service that exists within an SOA is essentially just a description of the message exchange patter between itself and its users. Within an SOA there are thus three critical roles: requester, provider, and broker. allows access to services, creates a description of a service and publishes it to the service broker. hosts a registry of service descriptions. It is responsible for linking a requestor to a service provider. is responsible for discovering a service by searching through the service descriptions given by the service broker. 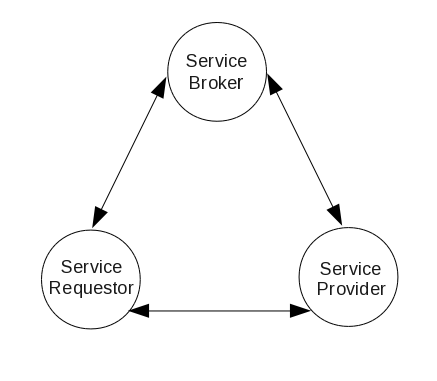 A requestor is also responsible for binding to services provided by the service provider. The Universal Description, Discovery and Integration registry is a directory service for Web Services. It enables service discovery through queries to the UDDI registry at design time or at run time. It also allows providers to publish descriptions of their services to the registry. The registry typically contains a URL that locates the WSDL document for the web services and contact information for the service provider. Within UDDI information is classified into the following categories. White pages: contain general information such as the name, address and other contact information about the company providing the service. Yellow pages: categorize businesses based on the industry their services cater to. Green pages: provide information that will enable a client to bind to the service that is being provided. The registry plays a central role within JBossESB. It is used to store endpoint references (EPRs) for the services deployed within the ESB. It may be updated dynamically when services first start-up, or statically by an external administrator. As with all environments within which registries reside, it is not possible for the registry to determine the liveness of the entities its data represents, e.g., if an EPR is registered with the registry then there can be no guarantee that the EPR is valid (it may be malformed) or it may represent a services that is no longer active. At present JBossESB does not perform life-cycle monitoring of the services that are deployed within it. As such, if services fail or move elsewhere, their EPRs that may reside within the registry will remain until they are explicitly updated or removed by an administrator. Therefore, if you get warnings or errors related to EPRs obtained from the registry, you should consider removing any out-of-date items. 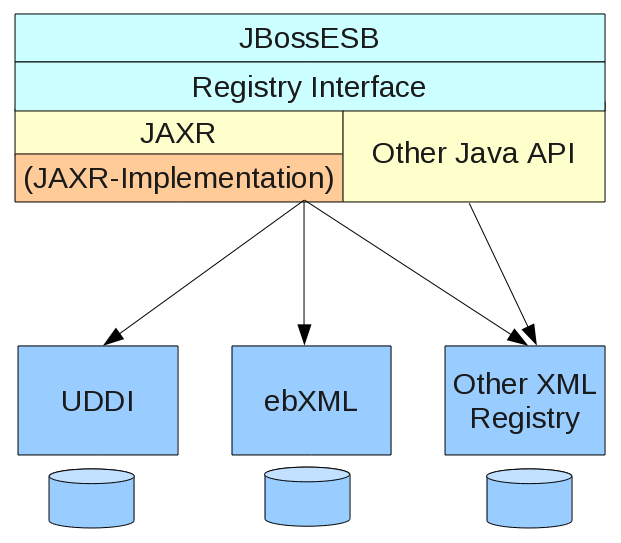 The JBossESB Registry architecture allows for many ways to configure the ESB to use either a Registry or Repository. 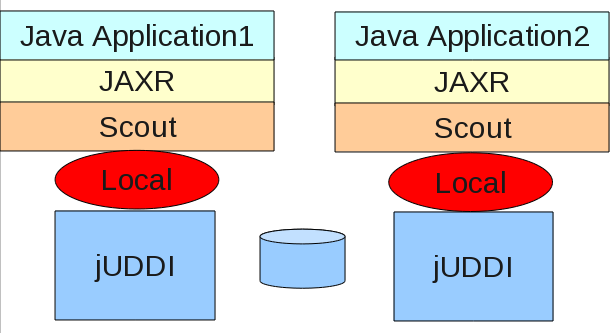 By default we use a JAXR implementation (Scout) and a UDDI (jUDDI), in an embedded way. A class that implements the jbossesb Registry interface. We have provided one implementation (JAXRRegistry interface). The class name of the JAXR ConnectionFactory implementation. The URI used by JAXR to edit. The URI used to authenticate. The user used for edits. The password to go along with the user. The UDDI version of the query. The name of the class used by scout to do the transport from scout to the UDDI. 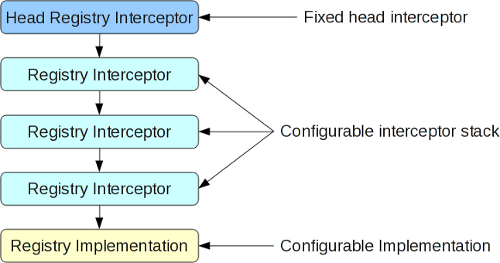 The list of interceptors that are applied to the configured registry. The codebase currently provides two interceptors, one for handling InVM registration and a second for applying a cache over the registry. The default interceptor list consists solely the InVM interceptor. The maximum number of server entries allowed in the cache. If this value is exceeded then entries will be evicted on a LRU basis. The default value is 100 entries. The validity period of the caching interceptor. This is specified in milliseconds and defaults to 600000 (ten minutes). If this value is zero (or less) then there is no expiry specified on the cache. The Organization Category name for the ESB instance. Default is "org.jboss.soa.esb.:category". The registry can be configured in many ways. Figure 1 shows a blue print of all the registry components. From the top down we can see that the JBossESB funnels all interaction with the registry through the Registry Interface. By default it then calls into a JAXR implementation of this interface. The JAXR API needs an implementation, which by default is Scout. 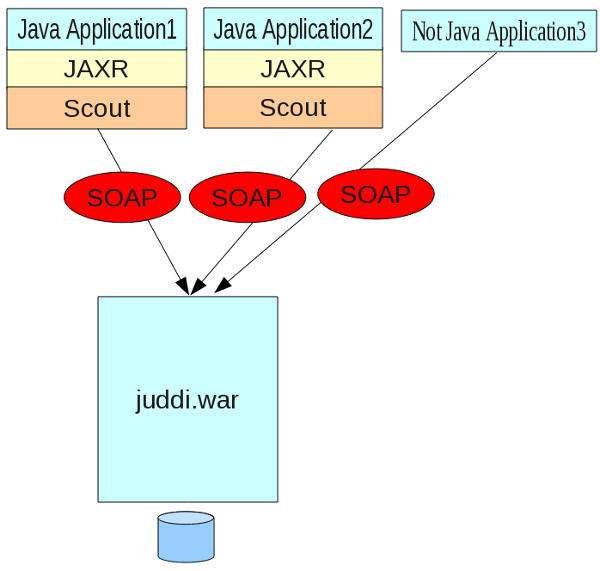 The Scout JAXR implementation calls into a jUDDI registry. However there are many other configuration options. By default we use the JAXR API. The JAXR API is a convenient API since it allows us to connect any kind of XML based registry or repository. However, if for example you want to use Systinet's Java API you can do that by writing your own SystinetRegistryImplementation class and referencing it in this property. If you decided to use JAXR then you will have to pick which JAXR implementation to use. This property is used to configure that class. By default we use Scout and therefore it is set to the scout factory org.apache.ws.scout.registry.ConnectionFactoryImpl. The next step is to tell the JAXR implementation the location of the registry or repository for querying and updating, which is done by setting the org.jboss.soa.esb.registry.queryManagerURI, org.jboss.soa.esb.registry.lifeCycleManagerURI, and org.jboss.soa.esb.registry.securityManagerURI respectively, along with the username (org.jboss.soa.esb.registry.user) and password (org.jboss.soa.esb.registry.password) for the UDDI. When using Scout with a UDDI implementation there is an additional parameter that one can set - the transport class that is used for communication between Scout and the UDDI registry. If you are using Scout to communicate with jUDDI v3, we suggest leaving the transportClass as LocalTransport and using jUDDI's esb.juddi.client.xml to use jUDDI's transports (InVM, RMI, WS). As seen above, a transport should specify a proxyTransport, a URL for all of the supported UDDI API (inquiry, publish, security, subscription, subscription-listener, custodytransfer), and a jUDDI API URL. The RMI transport also includes JNDI settings. By default, the RMI settings are enabled – to switch transports you can comment them out and enable whichever of the transports you choose. When using Scout with jUDDI there is an additional parameter that one can set. This is the transport class that should be used for communication between Scout and jUDDI. Thus far there are 4 implementations of this class which are based on SOAP, SAAJ, RMI and Local (embedded java). If you are using Scout to communicate with jUDDI v3, we suggest leaving the transportClass as LocalTransport and using jUDDI's uddi.xml to use jUDDI's transports (InVM, RMI, WS). access to the jUDDI database. You will need to create a schema in your database, and add the jbossesb publisher. The product/install/jUDDI-registry directory contains db create scripts for you favorite database. esb.juddi.xml and esb.juddi.client.xml. The configuration of jUDDI itself. The database can be automatically created if the user you have created has enough rights to create tables. jUDDI should be able to create a database for any database that has a Hibernate dialect associated with it. The registry supports the ability to intercept requests to the registry using an interceptor stack. Each interceptor in the stack is provided with an opportunity to service the request, provide direct responses to the request or to augment the responses received from a lower interceptor or registry implementation as it wishes. There are two interceptors provided in the current implementation. The InVM registry interceptor is responsible for handling any InVMEprs which are registered by any of the services executing within the same server instance. The information about the InVMEpr and its associated service will be cached within the interceptor, will not be propagated to subsequent interceptors and will be returned to the caller by augmenting results from subsequent interceptors/registry queries. The Caching registry interceptor retains a cache of Eprs and their associated services, evicting information from the cache on a LRU basis or after the information has expired. As mentioned before, by default the JBossESB is configured to use the JAXR API using Scout as its implementation and jUDDI as the registry. Here are some examples of how you can deploy this combo. All ESB components (with components we really mean JVMs in this case) can embed the registry and they all can connect to the same database (or different once if that makes sense). Deploy a version of the jUDDI that brings up an RMI service. The JBossESB deploys the RMI service by default – it starts the registry within the jbossesb.sar. The jbossesb.sar also registers a RMI service. The RMI clients need to have the scout-client.jar in their classpath. 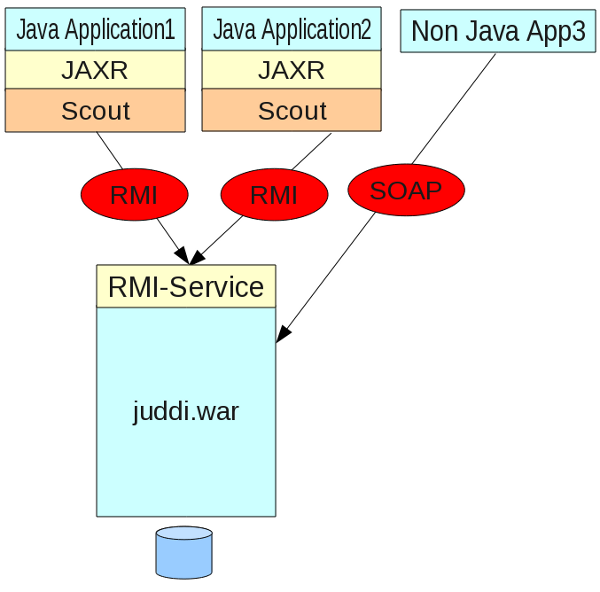 If you don't want to deploy the juddi.war you can setup one of the ESB components that runs in the the same JVM as jUDDI to register the RMI service. While the other applications need to be configured to use RMI. Finally, you can make the communication between Scout and jUDDI SOAP based. Again you need to deploy the juddi.war and configure the datasource. You probably want to shutdown the RMI service by commenting out the RegisterServicesWithJNDI servlet in the web.xml. 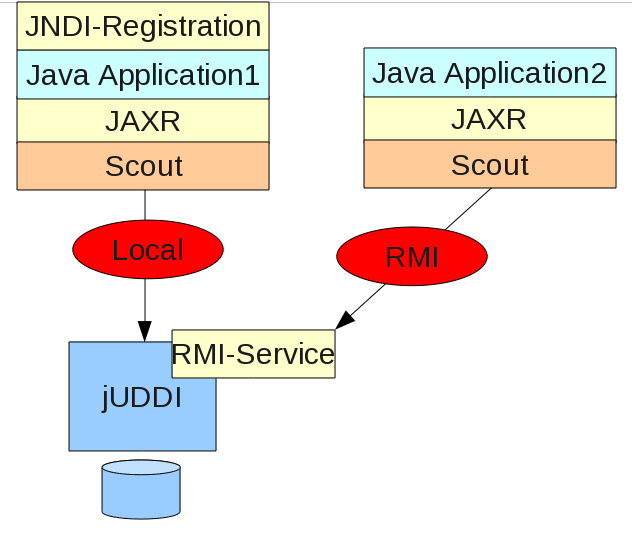 If you use RMI you need the juddi-client.jar, which can be found as part of the jUDDI distribution. Make sure the jbossesb-properties.xml file is on the classpath and read or else the registry will try to instantiate classes with the name of 'null'. Make sure you have META-INF/esb.juddi.client.xml that specifies a valid transport. Make sure the settings of your persistence.xml file are valid and that you are using the Hibernate dialect that matches your database. Make sure you have a esb.juddi.xml file on your classpath for jUDDI to configure itself with. In the event that a service fails or does not shut down cleanly, it is possible that stale entries may persist within a registry. You will have to remove these manually. The JBossESB Rule Service allows you to deploy rules created in Drools as services on the ESB. This is beneficial, because it means you don't have to develop as much client code to integrate rules into your application environment, and rules can be accessed as part of an action chain or orchestrated business process. To understand these types of services, you should first learn about Drools. Rule Services are supported by the BusinessRulesProcessor action class and the DroolsRuleService, which implement the RuleService interface. While it is possible to use rule engines other than Drools, only Drools is supported out the the box. The BusinessRulesProcessor supports rules loaded from the classpath that are defined in .drl files, .dsl files (domain specific language support), and .xls (decision table support) files. These are primarily for testing, prototypes, and very simple rule services. There is no way to specify multiple rule files in the jboss-esb.xml file, so complex rule services need to use the Drools KnowledgeAgent. Rules written in a Domain Specific Language. Use of the Drools KnowledgeAgent is the recommended approach for production systems. The BusinessRulesProcessor action supports both Drools stateless and stateful execution models. Most rule services will be stateless. That is, a message will be sent to the rule service that includes all the facts to be inserted into the rule engine in the message body, the rules will execute, updating either the message and / or the facts. Stateful execution takes place over time, with several messages being sent to the rule service, the rules being executed each time, the message and / or facts being updated each time, and a final message that tells the rule service to dispose of the stateful session working memory of the rule engine. There are limitations in this configuration, namely that there can only be a single (stateful) rule service in the message flow. This may change in the future, when there are better ways to identify a stateful conversation over the ESB. In ESB 4.8 and prior releases, the Drools Rule* API was used. In ESB 4.9, which uses Drools 5.1.0, the Drools Knowledge* API is used. The biggest change here is how the KnowledgeAgent is configured/run differently than the RuleAgent. Polling configuration for DRL changes is no longer done at the RuleAgent level (in the ruleAgentProperties file's "poll" property). It is now done globally, and can be configured by the property "org.jboss.soa.esb.services.rules.resource.scanner.interval", found within jbossesb-properties.xml. The default is 60. This means every 60 seconds, check for resource changes - across ALL KnowledgeAgents. Rules written in Drools drl, dsl, decision table, or business rule editor. The ESB Message content, i.e., the objects in the message, which is the data going into the rules engine (the “facts”). When a message is sent to the BusinessRulesProcessor, a certain rule set will execute over the objects in the message, and update those objects and / or the message. A rule set can be created using the JBoss Developer Studio which includes a plug-in for Drools, or with Eclispe 3.5 and the plugin installed (see Drools download site for the plugin). Since the message is added as a global, you need to add jbossesb-rosetta.jar to your Drools project. You can also write your rules using the Drools BRMS Business Rule Editor. When using the Drools BRMS, it is not necessary to add the ESB Message class to the imports, as long as jbossesb-rosetta.jar is somewhere on the classpath of the BRMS web application. For a detailed discussion on rule creation and the Drools language itself please see the Drools documention. The rationale for this is that most rule services will want to update the message as a way of communicating results to other services in the flow, so the BusinessRulesProcessor / DroolsRuleService will always set the message as a global. The consumer of a rule service has little to worry about. In a rule service environment there is no need for the consumer to worry about creating rulebases, creating working memories, inserting facts, or firing the rules. Instead the consumer just has to worry about adding facts to the message, and possibly some properties to the message. In other cases the data may be in an XML message, and a transformation service will be added to the message flow to transform the XML to POJOs before the rule service is invoked. These can be added directly by an ESB aware client. A non-ESB aware client would have to communicate the position of the message (first, ongoing, last) in the data, and an action class would need to be added to the pipeline to add the properties to the ESB message (see quickstarts/business_ruleservice_stateful for an example of this type of service). In ESB 4.6 and prior releases, the “continue” functionality for stateful rule execution did not dispose of working memories if the value of the property was false or it was absent. This has now been fixed through the work for JBESB-2900. The previous behavior can be re-enabled by changing the value of the configuration property “org.jboss.soa.esb.services.rules.continueState”, found within jbossesb-properties.xml, to true. This configures the action class and its name. The name is user defined. for specifying a properties file on the classpath that tells the rule agent how to find the rule package. This could specify a url or a local file system. Rules are in a drl, execution is stateful. In this scenario, a service may receive multiple messages over time and wish to use rules to accumulate data across this message set. Each time a message is received, the rules will be fired within the context of a single Stateful Session. The active Session can be disposed of (reset) via the “dispose” property. A single, synchronized Session instance is shared across all concurrent executions of a Stateful Session deployments. This greatly limits the type of usecase for which the Stateful deployment model is applicable. If multiple, client oriented sessions are required per Service deployment, consider using a jBPM/BPEL solution. Stateful Sessions are not persistent and are therefore volatile in nature. Stateful Sessions are not clustered. Rules are in a drl, execution is stateful, audit logging is enabled, and the Drools clockType, eventProcessingType and channels are set to aid in Complex Event Processing (CEP). In this scenario, a service may want to perform Drools audit logging so that the Drools Eclipse editor can parse the audit file for debugging. It also wants to specify a specific clock type or event processing type for CEP. Last it wants to specify Drools “Channels” to send Objects to (“Channels” used to be known as “ExitPoints”). A CEP scenario is a stateful scenario, and thus is shared across all concurrent executions of a Stateful Session deployment, just like in the Example above. Rules are in the BRMS, execution is stateless. The action attributes to the action tag are show in Table 1. The attributes specify which action is to be used and which name this action is to be given. The action properties are shown in Table 2. The properties specify the set of rules (ruleSet) to be used in this action. Description: Optional reference to a file containing the Drools ruleSet. The set of rules that is used to evaluate the content. Only 1 ruleSet can be given for each rule service instance. Description: Optional reference to a file containing the definition of a Domain Specific Language to be used for evaluating the rule set. If this is used, the file in ruleSet should be a dslr file. Description: Optional property which can be to true to enable 'hot' redeployment of rule sets. Note that this feature will cause some overhead on the rules processing. Note that rules will also reload if the .esb archive in which they live is redeployed. Description: This is an optional reference to a file containing the definition of a rule-specification spreadsheet. Description: Optional reference to a properties file containing the location (URL or file path) to the compiled rule package(s). Note there is no need to specify ruleReload with a KnowledgeAgent, since this is controlled through the Drools resource scanning/notification system. Description: Optional property which can be to true to specify that the rule service will receive multiple messages over time that will add fact to the rule engine working memory and re-execute the rules. NOTE: A single shared session is shared across all Service executions. Description: Optional property to pass Message objects into Drools WorkingMemory. Description: Optional property to have Drools perform audit logging. The log can be read into the Drools Eclipse plugin and inspected. Valid values are CONSOLE, FILE and THREADED_FILE. The default is that no audit logging will be performed. Description: Optional property to define the filepath for audit logging. Only applies to FILE or THREADED_FILE ruleAuditType. The default is "event". Note that JBoss Drools will append ".log" for you. The default location for this file is "." - the current working directory (which for JBoss is in its bin/ directory). Description: Optional property to define how often to flush audit events to the audit log. Only applies to the THREADED_FILE ruleAuditType. The default is 1000 (milliseconds). Description: Optional property to define the clock used by JBoss Drools. Valid values are REALTIME and PSEUDO. The default is REALTIME. Description: Optional property to define the event processing option used by Drools. The valid values are CLOUD or STREAM (useful for CEP). The default is CLOUD. Description: Optional property to define any Channels a rule can send Objects to. The Channel concept used to be known as an ExitPoint. Please refer to the "Channels" section below. objectname: name of the object name, attachments can be named or numbered, so for attachments this can be a number too. Result: gets the property object named "Order"
Result: gets getOrder() return object on the attached Object. Result: obtains the object named "Order1" from the body of the message. Next it will call getLineitem() on this object. More elements can be added to the query to traverse the bean graph. Remember that you have to add java import statements on the objects you import into your rule set. Finally, the Object Mapper can flatten out entire collections. For example a collectoin Orders will be unrolled, and each order object inserted into working memory. The ServiceChannel, which is provided out-of-the-box. All you have to do, as attributes to the send-to element, is specify the channel-name, service-category and service-name. There are also the optional async, timeout and set-payload-location (where the Object sent to that channel will be placed in a new ESB Message) attributes as described above. Under the covers, the ServiceInvoker is used to send the newly created ESB message to the target Service. Custom Channels. you can specify your own org.drools.runtime.Channel implementation class. The send-to attribute for this is channel-class. Your implementation requires a public no-arg constructor. If you want your implementation to be configurable, also implement the org.jboss.soa.esb.Configurable interface, and your setConfiguration(ConfigTree) method will be called, passing in the attributes and (sub) property elements to your custom Channel. It is recommended that you package up your code into units of functionality, using .esb packages. The idea is to package up your routing rules alongside the rule services that use the rule sets. The below shows a layout of the business_rules_service quickstart to demonstrate a typical package. Finally make sure to deploy and reference the jbrules.esb in your deployment.xml. Typically, information within the ESB is conveniently packaged, transferred, and stored in the form of a message. Messages are addressed to Endpoint References (services or clients), that identify the machine/process/object that will ultimately deal with the content of the message. However, what happens if the specified address is no longer valid? For example, the service has failed or been removed from service? It is also possible that the service no longer deals with messages of that particular type; in which case, presumably some other service still handles the original function, but how should the message be handled? What if other services besides the intended recipient are interested in the message's content? What if no destination is specified? One possible solution to these problems is Content-Based Routing. Content-based routing seeks to route messages, not by a specified destination, but by the actual content of the message itself. In a typical application, a message is routed by opening it up and applying a set of rules to its content to determine the parties interested in its content. The ESB can determine the destination of a given message based on the content of that message, freeing the sending application from having to know anything about where a message is going to end up. Routers, as their name suggests, route messages. They examine the content of the messages they receive, apply rules to that content, and forward the messages as the rules dictate. In addition to routers and services, some systems may also include harvesters, which specialize in finding interesting information, packaging it up as a formatted message before sending it to a router. Harvesters mine many sources of information including mail transfer agent message stores, news servers, databases and other legacy systems. The diagram below illustrates a typical CBR architecture using an ESB. At the heart of the system, represented by the cloud, is the ESB. Messages are sent from the client into the ESB, which directs them to the Router. This is then responsible for sending the messages to their ultimate destination (or destinations, as shown in this example). An easy way of performing content based routing in JBoss ESB is is via the XPath rules provider on the ContentBasedRouter action. This provider is very easy to use and supports both inline and external rule definitions. Defining inline XPath routing rules is trivial. You just need to configure the “cbrAlias” property to “XPath” and then define the routing rules in the <route-to> configurations in the container destinations property. Define the routing expressions in a .properties file, where the property keys are the destination names and the property values are the Xpath expressions for routing to the destination in question. Define the routing rules in the <route-to> configurations in the container destinations property, with the “destination-name” attribute referring to the XPath rule key as defined in the external .properties file. XML namespace prefix-to-uri mappings are defined in the <namespace> elements, contained within the “namespaces” container property. Namespaces prefix-to-uri mappings are define in exactly the same way for both inline and external rule definitions. An easy way of performing content based routing in JBoss ESB is is via the Regex rules provider on the ContentBasedRouter action. Defining inline Regex routing rules is trivial. You just need to configure the “cbrAlias” property to “Regex” and then define the routing rules in the <route-to> configurations in the container destinations property. Define the routing expressions in a .properties file, where the property keys are the destination names and the property values are the Regex expressions for routing to the destination in question. Define the routing rules in the <route-to> configurations in the container destinations property, with the “destination-name” attribute referring to the Regex rule key as defined in the external .properties file. a routing rule set, written in Drools drl (and optionally dsl) language. The ESB Message content, either the serialized XML, or objects in the message, which is the data going into the rules engine. destination(s) which is the result coming out of the rules engine. When a message gets sent to the CBR, a certain rule set will evaluate the message content and return a set of Service destinations. We discuss how a target rule set can be targeted, how the message content is evaluated and what is done with the destination results. Implements the Content Based Routing pattern. It routes a message to one or more destination services based on the message content and the rule set it is evaluating it against. The CBR throws an exception when no destinations are matched for a given rule set/message combination. This action will terminate any further pipeline processing, so it should be the last action of your pipeline. Implements the WireTap pattern. The WireTap is an Enterprise Integration Pattern (EIP) where a copy of the message is send to a control channel. The CBR-WT is identical in functionality to the ContentBasedRouter, however it does not terminate the pipeline which makes it suitable to be used as a WireTap. Implements the Message-Filter pattern. The Message Filter pattern represents the case where messages can simply be dropped if certain content requirements are not met. The CBR-MF is identical in functionality to the ContentBasedRouter, but it does not throw an exception if the rule set does not match any destinations. In this case the message is simply filter out. The message will be asserted into the working memory of the rules engine. Figure 2 shows an example where the MessageType is used to determine to which destination the Message is going to be send. This particular ruleSet is shipped in the JBossESBRules.drl file and the rule checks if the type is XML or Serializable. xpathMatch “<element>”: yields true if an element by this name is matched. xpathEquals “<element>”, “<value>”: yields true if the element is found and it's value equals the value. xpathGreaterThan “<element>”, “<value>”: yields true if the element is found and it's value is greater than the value. xpathLowerThan “<element>”, “<value>”: yields true if the element is found and it's value is lower then the value. xpathMatch expr "<expression>" use namespaces "<namepaces>"
xpathEquals expr "<expression>", "<value>" use namespaces "<namspaces>"
xpathGreaterThan "<expression>", "<value>" use namespaces "<namspaces>"
Notice that the namespace aware statements differ in that they need the extra “expr” in front of the XPath expression. This is do avoid colliding with the non XPath aware statements in the dsl file. The prefixes do not have to match those used in the xml to be evaluated, it only matters that the URI is the same. The XPathLanguage.dsl is defined in a file called XPathLanguage.dsl, and can be customized if needed, or you can define your own DSL altogether. The Quickstart called fun_cbr demonstrates this use of XPath. Now that we have seen all the individual pieces how does it all tie together? It basically all comes down to configuration at this point, which is all done in your jboss-esb.xml. The image shows a service configuration fragment. In this fragment the service is listening on a JMS queue. Each EsbMessage is passed on to in this case the ContentBasedRouter action class which is loaded with a certain rule set. It sets the EsbMessage into Working Memory, fires the rules, obtains the list of destinations and routes copies of the EsbMessage to these services. It uses the rule set JbossESBRules.drl, which matches two destinations, name 'xml-destination' and 'serialized-destination'. These names are mapped to real service names in the 'route-to' section. The action attributes to the action tag are show in the table below. The attributes specify which action is to be used and which name this action is to be given. The action properties are shown in the next table. The properties specify the set of rules (ruleSet) to be used in this action. ruleSet Name of the filename containing the Drools ruleSet. The set of rules that is used to evaluate the content. Only 1 ruleSet can be given for each CBR instance. ruleLanguage Optional reference to a file containing the definition of a Domain Specific Language to be used for evaluating the rule set. ruleAgentProperties This property points to a rule agent properties file located on the classpath. The properties file can contain a property that points to precompiled rules packages on the file system, in a directory, or identified by an URL for integration with the BRMS. See the “KnowledgeAgent” section below for more information. ruleReload Optional property which can be to true to enable 'hot' redeployment of rule sets. Note that this feature will cause some overhead on the rules processing. Note that rules will also reload if the .esb archive in which they live is redeployed. stateful Optional property which tells the RuleService to use a stateful session where facts will be remembered between invokations. See the “Stateful Rules” section for more information about stateful rules. destinations A set of route-to properties each containing the logical name of the destination along with the Service category and name as referenced in the registry. The logical name is the name which should be used in the rule set. object-paths Optional property to pass Message objects into Drools WorkingMemory. ruleAuditType Optional property to have Drools perform audit logging. The log can be read into the Drools Eclipse plugin and inspected. Valid values are CONSOLE, FILE and THREADED_FILE. The default is that no audit logging will be performed. ruleAuditFile Optional property to define the filepath for audit logging. Only applies to FILE or THREADED_FILE ruleAuditType. The default is "event". Note that JBoss Drools will append ".log" for you. The default location for this file is "." - the current working directory (which for JBoss is in its bin/ directory). ruleAuditInterval Optional property to define how often to flush audit events to the audit log. Only applies to the THREADED_FILE ruleAuditType. The default is 1000 (milliseconds). properties.Order, gets the property object named "Order"
attachment.1.Order, gets getOrder() return object on the attached Object. body.Order1.lineitem, obtains the object named "Order1" from the body of the message. Next it will call getLineitem() on this object. More elements can be added to the query to traverse the bean graph. Remember that you have to add java import statements on the objects you import into your rule set. Finally, the Object Mapper cannot flatten out entire collections, so if you need to do that you have to perform a (Smooks-) transformation on the message first, to unroll the collection.. Using stateful sessions means that facts will be remembered across invocations. When stateful is set to true the working memory will not be disposed. For more details about the RuleService please see RuleService chapter. 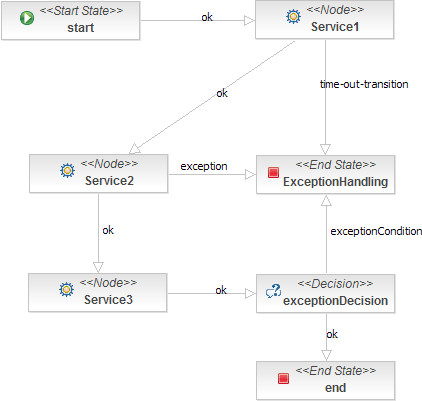 For an example of using stateful rules take a look at the business_ruleservice_stateful quickstart. By using the ruleAgentProperty property, you can use precompiled rules packages that can be located on the local file system, in a local directory, or point to an URL. For information about the configuration options that exist for the properties file please refer to the KnowledgeAgent section of the Drools manual. For an example of using a rule agent take a look at the business_ruleservice_ruleAgent quickstart. By using the ruleAgentProperties property, you can effectively integrate your service with a Business Rule Management System (BRMS). This can be accomplished by specifying a URL in the rule agent properties file. For information about the how to configure the URL and the other properties please refer to the KnowledgeAgent section of the Drools manual. For information about the how to install and configure the BRMS please refer to the Drools manual. The functionality of the Business Rule Processor (BRP) is identical to the Content Based Router, but it does not do any routing, instead it returns the modified EsbMessage for further action pipeline processing. You may mix business and routing rules in one rule set if you wish to do so, but routing will only occur if you use one of the three routing action classes mentioned earlier. The requirement is that your rule service implements the interface: org.jboss.soa.esb.services.rules.RuleService. It is recommended that you package up your code into units of functionality, using .esb packages. The idea is to package up your routing rules alongside the rule services that use the rule sets. The example below shows a layout of the simple_cbr quickstart to demonstrate a typical package. The SmooksAction can be used for splitting HUGE messages into split fragments and performing Content-Based Routing on these split fragments. The above illustration shows how we would like to perform the by-order-item splitting operation and route the split messages to file. The split messages contain a full XML document with data merged from the order header and the order item in question i.e. not just a dumb split. 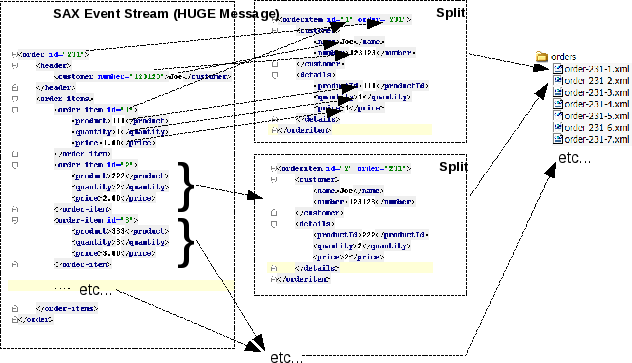 In this illustration, we simply route all the message fragments to file, but with the Smooks Action, we can also route the fragment messages to JMS and to a Database and in different formats (EDI, populated Java Objects, etc). The Smooks configuration for the above example would look as follows. Resource configurations #1 and #2 are there to bind data from the source message into Java Objects in the Smooks bean context. In this case, we're just binding the data into HashMaps. The Map being populated in configuration #2 is recreated and repopulated for every order item as the message is being filtered. The populated Java Objects (from resources #1 and #2) are used to populate a FreeMarker template (resource #4), which gets applied on every order item, with the result of the templating operation being output to a File OutputStream (resource #3). The File OutputStream (resource #3) also gets applied on every order item, managing the file output for the split messages. What the above does not show is how to perform the content based routing using <condition> elements on the resources. It also doesn't demonstrate how to route fragments to to message aware endpoints. We will be adding a quickstart dedicated to demoing these features of the ESB. Check the User Forum for details. JBossESB 4.8 upgrades to Smooks v1.1, which means that the split described above can be done without having to define the binding configurations (#1 and #2). For more on how to do this, see the documentation on “FreeMarker Transforms using NodeModels” in section 4 of the Smooks User Guide. XSLT: JBoss ESB supports message transformation through the standard XSLT usage model, as well as through the Smooks. ActionProcessor Data Transformation: Where Smooks can not handle a specific transformation usecase, you can implement a custom transformation solution through implementation of the org.jboss.soa.esb.actions.ActionProcessor interface. Message Transformation on JBossESB is supported by the SmooksAction component. 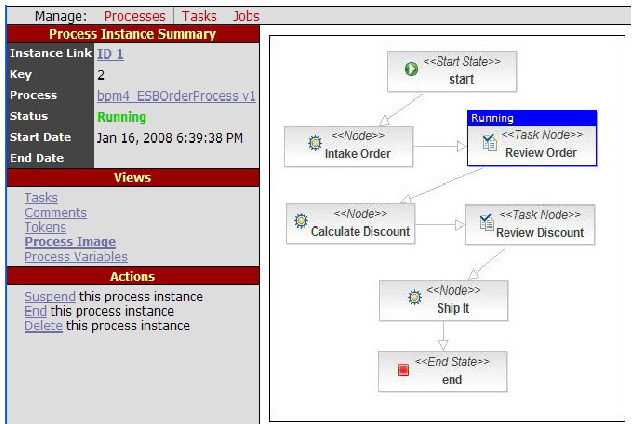 This is an ESB Action component that allows the Smooks Data Transformation/Processing Framework to be plugged into an ESB Action Processing Pipeline. A wide range of source (XML, CSV, EDI, Java etc) and target (XML, Java, CSV, EDI etc) data formats are supported by the SmooksAction component. A wide range of Transformation Technologies are also supported, all within a single framework. See the Message Action Guide for more details. A number of tutorials are available online on the Smooks website (http://www.smooks.org/mediawiki/index.php?title=Main_Page). Any of these samples can be easily ported to JBossESB (http://community.jboss.org/wiki/jbossesb). XSLT transformation are supported by the XstlAction. Please see the section “XSLTAction” in the ProgrammersGuide for more information. Note that some of the ESB Quickstarts are still using the older “SmooksTransformer” action class. The SmooksAction is a more flexible and easier to use alternative to the SmooksTransformer. The SmooksTransformer will be deprecated in a future release (and removed later again). 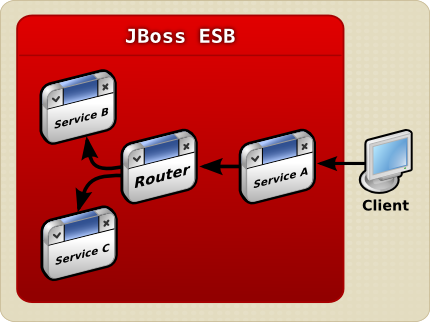 ESB services can be orchestrated using jBPM. You can create a jBPM process definition which makes calls into ESB services. jBPM allows you to incorporate human task management integrated with machine based services. The jbpm.esb deployment that ships with the ESB includes the full jBPM runtime and the jBPM console. The runtime and the console share a common jBPM database. The ESB DatabaseInitializer mbean creates this database on startup. The configuration for this mbean is found in the file jbpm.esb/jbpm-service.xml. The DatabaseInitializer mbean is configured in jbpm-service.xml to wait for the JbpmDS to be deployed, before deploying itself. The second mbean “JbpmService” ties the lifecycle of the jBPM job executor to the jbpm.esb lifecycle - it starts a job executor instance on startup and stops it on shutdown. The JbpmDS datasource is defined in the jbpm-ds.xml and by default it uses a HSQL database. In production you will want change to a production strength database. All jbpm.esb deployments should share the same database instance so that the various ESB nodes have access to the same processes definitions and instances. The jBPM console is a web application accessible at http://localhost:8080/jbpm-console, when you start the server. The login screen is shown below. Please check the jBPM documentation [TB-JBPM-USER] to change the security settings for this application, which will involve change some settings in the conf/login-config.xml. The console can be used for deploying and monitoring jBPM processes, but is can also be used for human task management. For the different users a customized task list will be shown and they can work on these tasks. The quickstart bpm_orchestration4 [JBESB-QS] demonstrates this feature. For more details on what the JbpmCallbackService does, please see the “jBPM to ESB” section later on in this chapter. The configuration of jBPM itself is managed by three files, the jbpm.cfg.xml and the hibernate.cfg.xml and the jbpm.mail.templates.xml. Other settings are left to the default jBPM settings. Hibernate is not used to create the database schema, instead we use our own DatabaseInitiazer mbean, as mentioned in the previous section. The jbpm.mail.templates.xml is left empty by default. For each more details on each of these configuration files please see the jBPM documentation. The configuration files that usually ship with the jbpm-console.war have been removed so that all configuration is centralized in the configuration files in the root of the jbpm.esb archive. 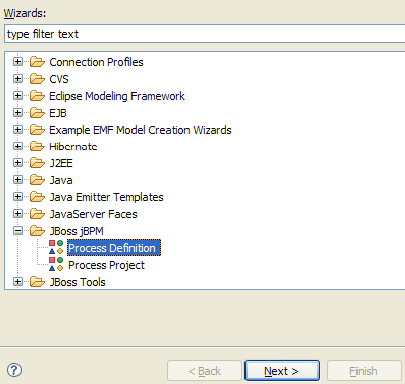 To create a Process Definition we recommend using the eclipse based jBPM Process Designer Plugin [KA-JBPM-GPD]. You can either download and install it to eclipse yourself, or use JBoss Developer Studio. The image below shows the graphical editor. The graphical editor allows you to create a process definition visually. Nodes and transitions between nodes can be added, modified or removed. The process definition saves as an XML document which can be stored on a file system and deployed to a jBPM instance (database). 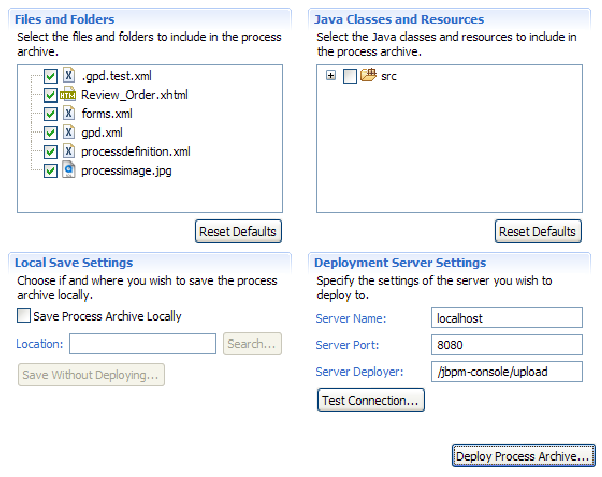 Each time you deploy the process instance jBPM will version it and will keep the older copies. This allows processes that are in flight to complete using the process instance they were started on. New process instances will use the latest version of the process definition. To deploy a process definition the server needs to be up and running. Only then can you go to the 'Deployment' tab in the graphical designer to deploy a process archive (par). Figure 3 shows the “Deployment” tab view. by using the DeployProcessToServer jBPM ant task. Start a new ProcessInstance given a process definition that was already deployed to jBPM. This command leaves the Process Instance in the start state, which would be needed if there is an task associated to the Start node (i.e. some task on some actor's tasklist). In most cases however you would like the new Process Instance to move to the first node, which is where the next command comes in. Identical to the NewProcessInstanceCommand, but additionally the new Process Instance is moved from the Start position into the first Node. The the root node variables for a process instance, using the process instance ID. Cancel a ProcessInstance. i.e. when an event comes in which should result in the cancellation of the entire ProcessInstance. This action requires some jBPM context variables to be set on the message, in particular the ProcessInstance Id. Details on that are discussed later. Required attribute. You are free to use any value for the name attribute as long as it is unique in the action pipeline. Needs to be one of: NewProcessInstanceCommand, StartProcessInstanceCommand, GetProcessInstanceVariablesCommand or CancelProcessInstanceCommand. required property for the NewProcessInstanceCommand and StartProcessInstanceCommand if the process-definition-id property is not used. The value of this property should reference a process definition that is already deployed to jBPM and of which you want to create a new instance. This property does not apply to the CancelProcessInstanceCommand. required property for the NewProcessInstanceCommand and StartProcessInstanceCommand if the process-definition-name property is not used. The value of this property should reference a process definition id in jBPM of which you want to create a new instance. This property does not apply to the CancelProcessInstanceCommand. specifies the jBPM actor id, which applies to the NewProcessInstanceCommand and StartProcessInstanceCommand only. optional property to specify the value of the jBPM key. For example one can pass a unique invoice id as the value for this key. On the jBPM side this key is as the “business” key id field. The key is a string based business key property on the process instance. The combination of business key + process definition must be unique if a business key is supplied. The key value can hold an MVEL expression to extract the desired value from the EsbMessage. For example if you have a named parameter called “businessKey” in the body of your message you would use “body.businessKey”. Note that this property is used for the NewProcessInstanceCommand and StartProcessInstanceCommand only. This property only applies to the StartProcessInstanceCommand, and is of use only if there are more then one transition out of the current node. If this property is not specified the default transition out of the node is taken. The default transition is the first transition in the list of transition defined for that node in the jBPM processdefinition.xml. optional attribute which can hold a default value if the esb MVEL expression does not find a value set in the EsbMessage. structurally identical to the “esbToBpmVars” property (above). Used with the GetProcessInstanceVariablesCommand for mapping jBPM process instance variables (root token variables) onto the ESB message. Optional property for the NewProcessInstanceCommand and StartProcessInstanceCommand. If this property is specified, with a value of true, then the creation of the process instance will store the ReplyTo/FaultTo EPRs of the invoking message within the process instance. These values can then be used within subsequent EsbNotifier/EsbActionHandler invocations to deliver a message to the ReplyTo/FaultTo addresses. required ESB message Body parameter that applies to the GetProcessInstanceVariablesCommand and CancelProcessInstanceCommand commands. It is up to the user make sure this value is set as a named parameter on the EsbMessage body. For ESB calls into jBPM an exception of the type JbpmException can be thrown from the jBPM Command API. This exception is not handled by the integration and we let it propagate into the ESB Action Pipeline code. The action pipeline will log the error, send the message to the DeadLetterService (DLS), and send the an error message to the faultTo EPR, if a faultTo EPR is set on the message. The JBossESB to jBPM maybe interesting but the other way around is probably far more interesting jBPM to JBossESB communication provides us with the capability to use jBPM for service orchestration. Service Orchestration itself will be discussed in more detail in the next chapter and here we're focusing on the details of the integration first. The integration implements two jBPM action handler classes. The classes are “EsbActionHandler” and “EsbNotifier”. The EsbActionHandler is a request-reply type action, which drops a message on a Service and then waits for a response while the EsbNotifier only drops a message on a Service and continues its processing. The interaction with JBossESB is asynchronous in nature and does not block the process instance while the Service executes. First we'll discuss the EsbNotifier as it implements a subset of the configuration of EsbActionHandler class. esbCategoryName – The category name of the ESB service, required if not using the reply-to-originator functionality. esbServiceName – The name of the ESB service, required if not using the reply-to-originator functionality. replyToOriginator – Specify the 'reply' or 'fault' originator address previously stored in the process instance on creation. globalProcessScope - optional element. This boolean valued parameter sets the default scope in which the bpmToEsbVars are looked up. If the globalProcessScope is set to true the variables are looked for up the token hierarchy (= process-instance scope). If set to false it retrieves the variables in the scope of the token. If the given token does not have a variable for the given name, the variable is searched for up the token hierarchy. If omitted the globalProcessScope is set to false for retrieving variables. and one can reference jBPM context variable names directly. esb – optional attribute. The name of the variable on the EsbMessage. The name can be a MVEL type expression. By default the variable is set as a named parameter on the body of the EsbMessage. If you decide to omit the esb attribute, the value of the bpm attribute is used. default – optional attribute. If the variable is not found in jBPM context the value of this field is taken instead. process-scope – optional attribute. This boolean valued parameter can override the setting of the setting of the globalProcessScope for this mapping. When working on variable mapping configuration it is recommended to turn on debug level logging. esb – required attribute which can contain an MVEL expression to extract a value anywhere from the EsbMessage. bpm – optional attribute containing the name which be used on the jBPM side. If omitted the esb name is used. default – optional attribute which can hold a default value if the esb MVEL expression does not find a value set in the EsbMessage. The name of the transition that should be taken if an exception occurs while processing the Service. This requires the current node to have more then one outgoing transition where one of the transition handles “exception processing”. to the node element. Now if no signal is received within 10 seconds of entering this node, the transition called “time-out” is taken. There are two types of scenarios where exceptions can arise. The first type of exception is a MessageDeliveryException which is thrown by the ServiceInvoker. If this occurs it means that delivery of the message to the ESB failed. If this happens things are pretty bad and you have probably misspelled the name of the Service you are trying to reach. This type of exception can be thrown from both the EsbNotifier as well as the EsbActionHandler. In the jBPM node one can add an http://docs.jboss.com/jbpm/v3/userguide/processmodelling.html [TB-JBPM-USER] to handle this exception. The second type of exception is when the Service received the request, but something goes wrong during processing. Only if the call was made from the EsbActionHandler does it makes sense to report back the exception to jBPM. If the call was made from the EsbNotifier jBPM processing has already moved on, and it is of little value to notify the process instance of the exception. This is why the exception-transition can only be specified for EsbAction-Handler. Node “Service1” has 2 outgoing transitions. The first one is called “ok” while the second one is called “time-out-transition”. Under normal processing the call back would signal the default transition, which is the “ok” transition since it is defined first. However if the execution of the service takes more then 10 seconds the timer will fire. The transition attribute of the timer is set to “time-out-transition”,so this transition will be taken on time-out. In Figure 5 this means that the processing ends up in the “ExceptionHandling” node in which one can perform compensating work. Figure 5.5. Three Exception Handling Scenarios: Time-Out, Exception-Transition and Exception-Decision. where in the action, the exceptionTransition is set to “exception”. In this scenario the process also ends in the “ExceptionHandling” node. For more details on conditional transitions please see the jBPM documentation [TB-JBPM-USER]. Service Orchestration is the arrangement of business processes. Traditionally BPEL is used to execute SOAP based WebServices. If you want to orchestrate JBossESB regardless of their end point type, then it makes more sense to use jBPM. This chapter explains how to use the integration discussed earlier to do Service Orchestration using jBPM. JBossESB provides WS-BPEL support via its Web Service components. For details on these components and how to configure and use them, see the Message Action Guide. JBoss and the JBoss Enterprise Service Bus team also have a special support agreement with ActiveEndpoints who built the award-winning ActiveBPEL WS-BPEL Engine. JBoss and JBossESB also have a special support agreement with ActiveEndpoints (http://www.active-endpoints.com/) for their award wining ActiveBPEL WS-BPEL Engine. In support of this, JBossESB ships with a Quickstart dedicated to demonstrating how JBossESB and ActiveBPEL can collaborate effectively to provide a WS-BPEL based orchestration layer on top of a set of Services that don't expose Webservice Interfaces (the “webservice_bpel” Quickstart). JBossESB provides the Webservice Integration and ActiveBPEL provides the Process Orchestration. A number of flash based walk-thrus of this Quickstart are also available online: http://labs.jboss.com/jbossesb/resources/tutorials/bpel-demos/bpel-demos.html. ActiveEndpoints WS-BPEL engine does not run on versions of JBossAS since 4.0.5. However, it can be deployed and run successfully on Tomcat as our examples illustrate. A key component of Service Orchestration is to use a flow-chart like design tool to design and deploy processes. The jBPM IDE can be used for just this. Figure 6 shows an example of such a flow-chart, which represents a simplified order process. This example is taken from the bpm_orchestration4 quick start [JBESB-QS] which ships with JBossESB. In the “Order Process” Diagram three of the nodes are JBossESB Services, the “Intake Order”, “Calculate Discount” and the “Ship It” nodes. For these nodes the regular “Node” type was used, which is why these are labeled with “<<Node>>”. Each of these nodes have the EsbActionHandler attached to the node itself. This means that the jBPM node will send a request to the Service and then it will remain in a wait state, waiting for the ESB to call back into the node with the response of the Service. The response of the service can then be used within jBPM context. For example when the Service of the “Intake Order” responds, the response is then used to populate the “Review Order” form. The “Review Order” node is a “Task Node”. Task Nodes are designed for human interaction. In this case someone is required to review the order before the Order Process can process. To create the diagram above, select File > New > Other, and from the Selection wizard select “JBoss jBPM “Process Definition” as shown in below. The wizard will direct you to save the process definition. From an organizational point of view it is recommended use one directory per process definition, as you will typically end up with multiple files per process design. After creating a new process definition. You can drag and drop any item from menu, shown in Figure 8, into the process design view. You can switch between the design and source modes if needed to check the XML elements that are being added, or to add XML fragments that are needed for the integration. Recently a new type of node was added called “ESB Service" [KA-BLOG]. Figure 6.3. jBPM IDE menu palette. These Service can be referenced using the EsbActionHandler or EsbNotifier Action Handlers as discussed in Chapter 1. The EsbActionHandler is used when jBPM expects a response, while the EsbNotifier can be used if no response back to jBPM is needed. Now that the ESB services are known we drag the “Start” state node into the design view. A new process instance will start a process at this node. Next we drag in a “Node” (or “ESB Service “if available). Name this Node “Intake Order”. We can connect the Start and the Intake Order Node by selecting “Transition” from the menu and by subsequently clicking on the Start and Intake Order Node. You should now see an arrow connecting these two nodes, pointing to the Intake Order Node. 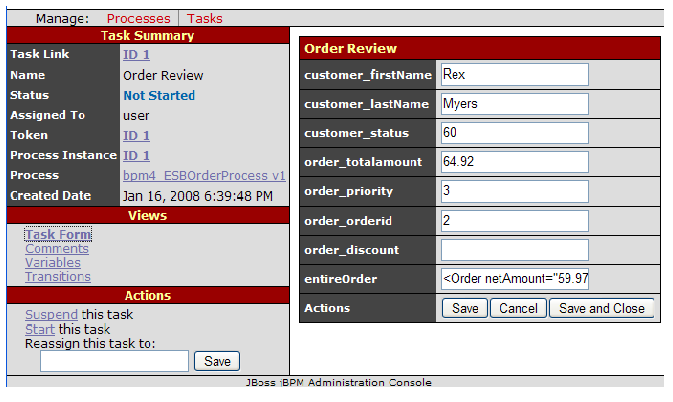 So after this Service returns we have the following variables in the jBPM context for this process: entireOrderAsXML, entireOrderAsObject, entireCustomerAsObject, and for demo purposes we also added some flattened variables: order_orderid, order_totalAmount, order_priority, customer_firstName, customer_lastName and customer_status. which references the variables set in the jBPM context. 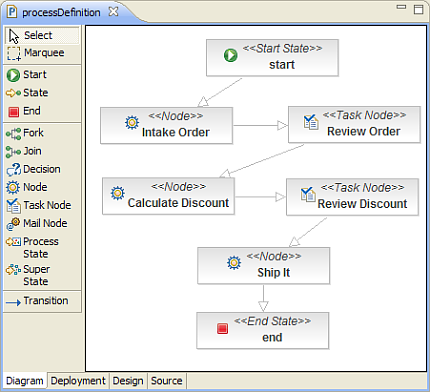 When the process reaches the “Review Node”, as shown in Figure 9. When the 'user' user logs into the jbpm-console the user can click on 'Tasks” to see a list of tasks, as shown in below. The user can 'examine' the task by clicking on it and the user will be presented with a form as shown below. The user can update some of the values and click “Save and Close” to let the process move to the next Node. Figure 6.5. 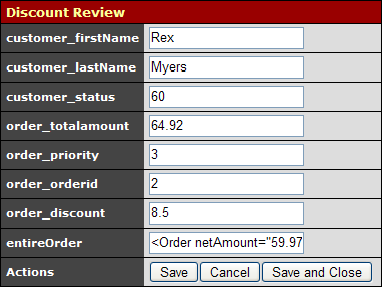 The Task List for User "User"
The Service receives the customer and orderHeader objects as well as the entireOrderAsXML, and computes a discount. The response maps the body.order_orderDiscount value onto a jBPM context variable called “order_-discount”, and the process is signaled to move to the “Review Discount” task node. After notifying the ShippingService the Order process moves to the 'end' state and terminates. The ShippingService itself may still be finishing up. In bpm_orchestration4 [JBESB-QS] it uses drools to determine whether this order should be shipped 'normal' or 'express'. In the previous paragraph we create the process definition and we quietly assumed we had an instance of it to explain the process flow. But now that we have created the processdefinition.xml, we can deploy it to jBPM using the IDE, ant or the jbpm-console (as explained in Chapter 1). In this example we use the IDE and deployed the files: Review_Order.xhtml, forms.xml, gpd.xml, processdefinition.xml and the processimage.jpg. 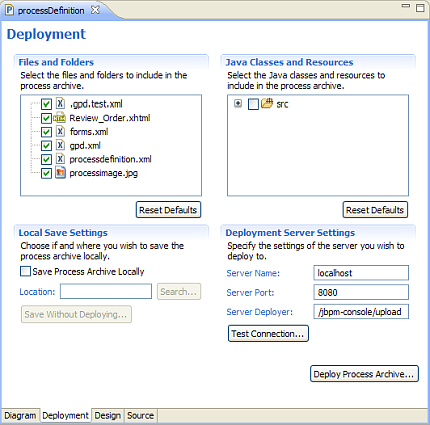 On deployment the IDE creates a par achive and deploys this to the jBPM database. We do not recommend deploying Java code in par archives as it may cause class loading issues. Instead we recommend deploying classes in jar or esb archives. <Order orderId="2" orderDate="Wed Nov 15 13:45:28 EST 2006" statusCode="0"
Both ESB as well as jBPM deployments are hot. An extra feature of jBPM is that process deployments are versioned. Newly created process instances will use the latest version while existing process instances will finish using the process deployment on which they where started. We have demonstrated how jBPM can be used to orchestrate Services as well as do Human Task Management. Note that you are free to use any jBPM feature. For instance look at the quick start bpm_orchestration2 [JBESB-QS] how to use the jBPM fork and join concepts. In JBossESB 4.2 the Message Store is also used for storing messages that need to be redelivered in the event of failures. See the Programmers Guide around the ServiceInvoker for further details. The MessageStore is responsible for reading and writing Messages upon request. Each Message must be uniquely identified within the context of the store and each MessageStore implementation uses a URI to accomplish this identification. This URI is used as the “key” for that message in the database. MessageStore implementations may use different formats for their URIs. Messages can be stored within the store based upon classification using addMessage. If the classification is not defined then it is up to the implementation of the MessageStore how it will store the Message. Furthermore, the classification is only a hint: implementations are free to ignore this field if necessary. It is implementation dependent as to whether or not the MessageStore imposes any kind of concurrency control on individual Messages. As such, you should use the removeMessage operation with care. Because the current MessageStore interface is designed to support both audit trail and redelivery scenarios, you should not use the setUndelivered/setDelivered and associated operations unless they are applicable! The default implementation of the MessageStore is provided by the org.jboss.internal.soa.esb.persistence.format.db.DBMessageStoreImpl class. The methods in this implementation make the required DB connections (using a pooled Database Manager DBConnectionManager). To override the MessageStore implementation you should look at the MessageActionGuide and the MessagePersister Action. The MessageStore interface does not currently support transactions. Any use of the MessageStore within the scope of a global transaction will, therefore, be unco-ordinated. The implication of this is that each MessageStore update or read will be undertaken separately and independently. However, future versions of the software shall provide control over whether or not specific interactions are to be conducted within the scope of an "enclosing" transactional context. The Message Store interface does not currently support transactions. As such, any use of the store within the scope of a global transaction will not be coordinated within the scope of any global transaction, i.e., each message store update or read will be done as a separate, independent, transaction. Future versions of the Message Store will provide for control over whether or not specific interactions should be conducted within the scope of any enclosing transactional context. The scripts for the required database schema, are again, very simple. They can be found under lib/jbossesb.esb/message-store-sql/<db_type>/create_database.sql of your JBossESB installation. This logic uses the new UUID random number generator in jdk 1.5. the type will be the type of the stored message. 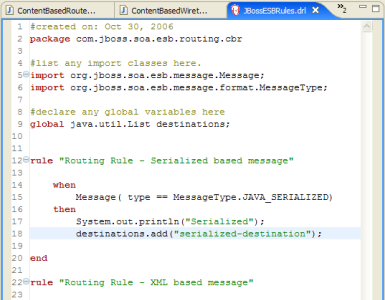 JBossESB ships with JBOSS_XML and JAVA_SERIALIZED currently. The supplied database message store implementation works by invoking a connection manager to your configured database. Supplied with JBoss ESB is a standalone connection manager, and another for using a JNDI datasource. Once you have implemented this interface, you update the properties file with your new class, and the connection manager factory will now use your implementation. Services in JBossESB can be configured to be secure which means that the service will only be executed if authentication succeeds and if the caller is authorized to execute the service. A service can be invoked by using a gateway or by using the ServiceInvoker to directly invoke the ESB service. When calling a service via a gateway, the gateway is responsible for extracting the security information needed to authenticate the caller. It does this by extracting the information from the transport that the gateway handles. Using this information the gateway creates an authentication request that is encrypted and then passed to the ESB. When using the ServiceInvoker a gateway is not involved and it is the responsibility of the client to create the authentication request prior to invoking the service. Both of these situations will be looked at in the following sections. The default security implementation is JAAS based but this is a configurable feature. The following sections describe the security components and how they can be configured. This is the concrete SecurityService implementation that should be used. Required. Default is JaasSecurityService. A default CallbackHandler implementation when a JAAS based SecurityService is being used. See “Customizing security” for more information about the callbackHandler property. The algorithm to use for sealing the SecurityContext. The size of the secret/symmetric key used to encrypt/decrypt the SecurityContext. The amount of time in milliseconds that a security context is valid for. This is a global setting that may be overridden on a per service basis by specifying this same property name on the security element in jboss-esb.xml. Configures a global SecurityContextPropagator. For more details on the SecurityContextPropagator please refer to the “Security Context Propagation”. Path to the keystore that holds a keys used for encrypting and decrypting data external to the ESB. This is used to encrypt the AuthenticationRequest. Password to the public keystore. Password for the alias if one was specified upon creation. Cipher transformation in the format: “algorithm/mode/padding”. If not specified this will default to the keys algorithm. The JAAS login modules are configured in the way you would except using the login-config.xml file located in the conf directory of your JBoss Application Server. So you can use the ones that come pre-configured but also add your own login modules. By default JBossESB ships with an example keystore which should not be used in production. It is only provided as a sample to help users get security working “out of the box”. The sample keystore can be updated with custom generate key pairs. An optional comma separated list of roles that are allowed to execute the service. This is a check that is performed after a caller has been authenticated, to verfiy that the caller in a member of the roles specified. The roles will have been assigned after a successful authentication by the underlying security mechanism. An optional CallbackHandler that will override the one defined in jbossesb-properties.xml. Optional properties can be defined which will be made available to the CallbackHandler implementation. Optional property that lets the service override the global security context timeout (ms) specified in jbossesb-properties.xml. Optional property that lets the service override the global security context propagator class implementation specified in jbossesb-properties.xml. To authenticate a caller, security information needs to be provided. If the call to the service is coming through a gateway, then the gateway will extract the required information from the transport that the gateway works with. For a web service call this would entail extracting either the UsernameToken or the BinarySecurityToken from the security element in the SOAP header. When a service needs to call another services and that service requires authentication, another authentication process will be performed. So having a chain of services that are all configured for authentication will cause multiple authentications to be performed. To minimize such overhead the ESB will store an encrypted SecurityContext which will be propagated with the ESB Message object between services. If the ESB detects that a Message has a SecurityContext, it checks that the SecurityContext is still valid, and if so, re-authentication is not performed. Note that the SecurityContext is only valid on a single ESB node. If the message is routed to a different ESB node, re-authentication will be required. An AuthenticationRequest is intended to carry security information needed for authentication between a gateway and a service, or between two services. The authentication context is encrypted and then set in the message context. This will be decrypted by the ESB to perform authentication. See the “SecurityService Configuration” section for information on how to configure the public keystore for this purpose. The “security_basic” quickstart shows an example of using a external client and how to prepare the Message before using the ServiceInvoker, see the SendEsbMessage class for more information. This quickstart also shows how you can configure jbossesb-properties.xml for client usage. A SecurityContext in JBossESB is an object that is local to a specific ESB node, or really to the JVM of the node. The SecurityContext is created after a successful authentication has be performed and it will be used locally in the ESB where it was created to save having to re-authenticate with every call. A timeout is specified for the context which is the time, in milliseconds, that the context is valid for. This value can be specified globally in jbossesb-properties.xml of overridden per-service by specifying the value in jboss-esb.xml. Please see “Configuring Secuirtyon a Service” and “SecurityService Configuration” to see how this is done. Propagation, in this case, refers to propagating security context information in a way specific to an external system. For example, you might want to have the credentials that were used to call the ESB, be used as the credentials when calling an EJB method. This can be accomplished by specifying a SecurityContextPropagator that will perform the security context propagation specific to the destination environment. A SecurityContextPropagator can be configured globally by specifying the 'org.jboss.soa.esb.services.security.contextPropagatorImplementationClass' in jbossesb-properties.xml, or per-service by specifying the same property in jboss-esb.xml. Please see “Configuring Security on a Service” and “SecurityService Configuration” for examples of this. This propagator will propagate security credentials to a JBoss Application Server(AS). If you need to write your own implementation you only have to write a class that implements org.jboss.internal.soa.esb.services.security.SecurityContextPropagator and then either specify that implementation in jbossesb-properties.xml or jboss-esb.xml as noted above. The default security implementation in JBossESB is based on JAAS and named JaasSecurityService. Custom login modules can be added in conf/login-config.xml of an JBoss Application Server. Since different login modules will require different information, the callback handler to be used can be specified in the security configuration for that Service. This can be accomplished by specifying the 'callbackHandler' attribute belonging to the security element defined on the service. The AuthenticationRequest will contain the principal and credentials needed authenticate a caller. The SecurityConfig will give access to the security configuration in jboss-esb.xml. Both of these are made available to the CallbackHandler which it can use to populate the Callback instances required by the login module. This section lists the login modules provided with JBossESB. Please note that all login modules available with JBoss AS are available as well and custom login modules should be easy to add. This login module performs authentication by verifiying that a certificate passed with the call to the ESB, can be verified against a certificate in a local keystore. Upon successful authentication the certificates Common Name(CN) will be used to create a principal. If role mapping is in use then it is the CN that will be used in the role mapping. See “Role Mapping” for details on the role mapping functionality. Identifies the JAAS Login module to use. This module will be specified in JBossAS login-config.xml. Comma separated lite of roles that are allowed to execute this service. The alias to look up in the local keystore which will be used to verify the callers certificate. Path to the keystore that will be used to verify the certificates. This can be a file on the local file system or on the classpath. Password for the above keystore. Optional. Path to a file containing role mappings. Please refer to the section “Role Mapping” for more details on this. # for the certificate as the user name. For an example please look at the security_cert quickstart. Configuration files in JBossESB sometimes require passwords which up until now have been specified in clear text in the configuration files. This is a security risk and something that should be avoided. In JBossESB you have the ability to specify a path to a file that contains an encrypted password wherever a password is required. The salt used for the encryption. This is the “welcometojboss” string in the example above. The number of iterations. This is the number 13 in the example above. The password you wish to encrypt. This is the string “testpass” in the example above. The name of the file where the encrypted password will be saved. This is the “esb.password” string in the example above. Configuration is done by simply substituting the clear text password in your configuration file(s) with the path to the encrypted password file. The default implementation is based on JAAS, but this can be customized by implementing the above interface and configuring the custom SecurityService to be used in jbossesb-properties.xml. For more details of the SecurityService interface methods, please refer to the javadocs. Initial conversion from OpenOffice ODT files.